KIWI is among the very few recent introductions which have surpassed in popularity due to its tremendous commercial potential in the sub Himalayan region of India. A native to central China, it is being grown commercially in New Zealand, Italy, USA, Japan, Australia, France, Chile and Spain. 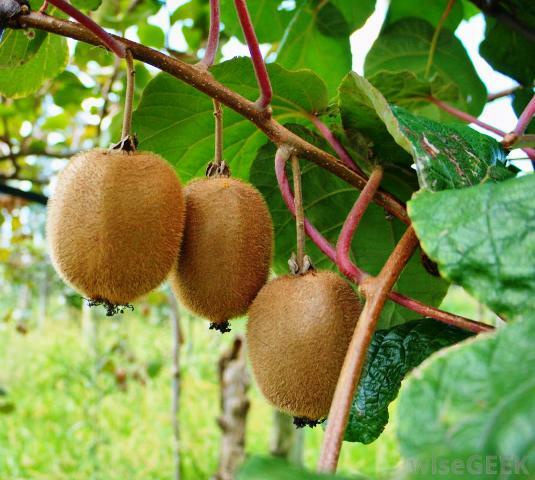 In India, kiwi was first planted in the Lal Bagh Gardens at Bangalore as an ornamental tree. With extensive research and development support its commercial cultivation has been extended to the midhills of Himachal Pradesh, Uttar Pradesh, Jammu and Kashmir, Sikkim, Meghalaya, Arunachal Pradesh and Nilgiri hills in India. 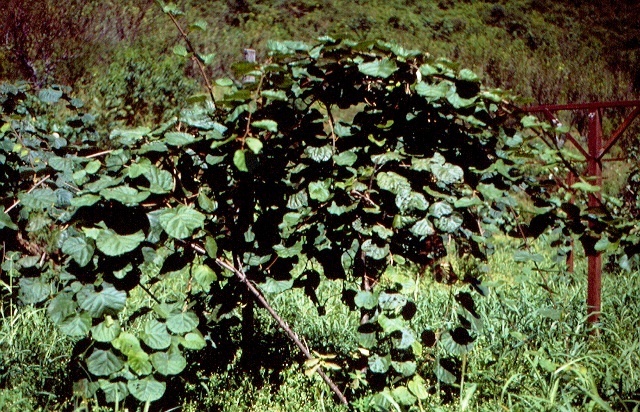 Kiwi is a deciduous vine which can withstand wide climatic conditions. However, for high yield quality fruits, it requires 700-800 chilling hours below 7`C to break its rest period in the winter otherwise the bud break may be delayed. It may be damaged by (I) autumn frost on the crop and the non dormant plant from October end to November end, (II) frost at the end of the winter before and during the budburst, and (III) spring frost after budburst. In summer, high temperature (> 35`C) accompanied by high insulation and low humidity may cause scorching of leaves. Sun scald and heat stresses are the main problems in its cultivation in lower areas. In India, kiwi can successfully be grown at 800 -1,500 m above mean sea level. A rainfall of about 150 cm/ year is sufficient. It should be well distributed throughout the growing period. The plant does not withstand strong winds during the growing period because of its vigorous vegetative growth, large leaves and viny habit. Therefore, windy sites should be avoided or windbreaks should be established well before planting. It can be grown on a wide range of soils but deep, rich, well drained sandy loam soils are ideal. A soil pH slightly less than 6.9 results in maximum yield but higher pH up to 7.3 affects adversely because of M n deficiency. Heavy wet soils are not suitable as plants do not tolerate wet feet for long. This is an early flowering and early maturing cultivar. The oblong, medium sized, fruits are covered with dense hairs. They are very sweet in taste with lower ascorbic acid content and medium titratable acidity. Fruits resemble those of Abbott, except that these are slightly broader in proportion to its length. The petals of its flowers are overlapping and crimped along with margins. It is an early ripening, heavy bearer and sweet in taste. Ascorbic acid and titratable acidity are on the lower side. This variety is most suited for Himachal Pradesh. This cultivar requires comparatively less chilling period. The fruits are tapering in shape towards the stem end. They are longest among all the cultivars. The fruits is dark brown having very dense, short and bristly hair, highest in ascorbic acid and titratable acidity. The bearing is very heavy. Most popular cultivar or the world, Hayward is comparatively shy bearer with a tendency of biennial bearing. The fruit is broad and flat, being much wider in relation to length. It is superior in flavour with high sugar and ascorbic acid content. It requires comparatively more chilling hours. It is a late flowering cultivar but fruit maturity is not late. The fruits are oblong, resembling those of Abbot and Allison. Being a highly prolific bearer cultivar, sometimes it needs hand thinning for obtaining good sized fruits. The fruit is somewhat wider towards blossom end with higher acidity and medium sugar content. It is a good pollenizer for Hayward and Monty, the late flowering kiwis. Flowers appear usually in groups of 5. It is also used for pollenizing different cultivars. The propagation through cuttings is most rapid and suitable method of multiplication. Various types of stem cuttings—hard wood, semi hardwood and soft wood—are quite successful, though the technique and success in rooting varies. The cuttings 0.5- 1.0 cm thick with relatively short internodes and 15- 30 cm long are ideal. Hard wood cuttings are prepared during the dormant season (January-February) from the previous year summer growth. Well matured dormant shoots are used for cutting having at least three healthy bold buds from middle of the shoot. Tips of the shoots should be avoided as they give a very low rate of rooting. The cuttings of the central and basal parts are ideal. Cuttings having more number of spurs should not be selected. The cuttings are treated with IBA (500 ppm) for 10 seconds and set deeply in moist rooting medium. To prevent the cuttings from desiccation and rotting the top portion of the cuttings are waxed. A rooting medium consisting of farmyard manure: sand: leaf compost: soil in the ratio of 1:1:1:1 results in highest rooting in open conditions. The cuttings should be thatched or shaded with shade net. Irrigations are given frequently. Adequate drainage should be provided to keep the nursery bed weed free. As they become about 15. 25 cm high, their terminal growth is pinched off to divert the food and nutrients for root growth and development. Hardwood cuttings can also be raised under intermittent mist in a mist propagation chamber or polythene house. The rooting media consisting of sand, farmyard manure, soil, saw dust and coal in a 2:1:2:1:1 ratio gives a good success. The cuttings should be treated with a mixture of IBA(2, 500 ppm) and NNA (2, 500 ppm) solution for 20-30 seconds and misted for 2-3 minutes at every 15-20 minutes intervals for 5-6 hr in a day. Soft wood cuttings generally root easier and quicker than hard wood cuttings but they require more attention and sophisticated propagating structure (mist chamber). Semi hard wood cutting with 3 buds and 0.5 – 1.0 cm in thickness from the middle portion of the current season’s growth are taken in July. A wound of about 1 cm length is made on one side of the base just below the node. Lower leaf on the basal bud are removed while two leaves are retained but reduced to 20- 50 % by a circular cut maintaining the natural leaf shape. The cuttings are treated with sand as the rooting media. Intermittent mist should be applied at 10 min. interval. With this method 70 -75 successes is achieved. Kiwi plants are also propagated by grafting. Though it takes almost two years to develop a nursery plant through grafting or budding onto the seedlings but this method is easiest and most economical. The kiwi plants can be raised through tongue grafting of kiwi seedlings during January- February. Freshly extracted kiwi seeds ripe fruits need 10 week stratification in different layers of sand under field conditions. Under agroclimatic zones where winter temperature is sufficiently low to 15`C, kiwi seeds ca be sown directly in the seed beds during the first fortnight of December. Seed beds should be mulched with grass, till the seeds start germination. Germinating seeds and baby seedlings are very sensitive to sun scald and direct sun. The young cotyledon leaves turn brown, developing damping off symptoms. They ultimately die. Thus on starting of seed germination, mulch should be removed and the seed bed should immediately be covered with Hessian cloth (gunny bag) or with pruning wood thatch till 5-6 leaves appear on the seedlings. The grafting should preferably be done during dormant season, January-February being ideal time. The scion of the thickness of rootstock should be selected and packed in sphagnum moss. It can be stored at 4`C in refrigerator if necessary. Of various methods of grafting, whip and tongue are ideal. Seedlings become ready for budding normally at the end of first growing season when the stem diameter is about 6-8 mm. scion buds are obtained from the current season’s growth. One or two buds are inserted on the main stem by T budding method at 10 cm above the ground level. Chip budding during mid February results in bud take as high as 95%. The bud is firmly secured into position by tagging with a polythene tape. When the bud has taken, the top or the vine is cut above the union during the following dormant season. The protection to the young growing shoot from the bud is very important because it is very brittle and easily breaks. Land having very gentle slope is ideal for it. Steep land should be contoured into terraces for planting vines. If possible its rows should be oriented in a north south direction to avail maximum sunlight. A thorough preparation of soil is essential for the successful establishment of its vineyard. Preparation of pits, mixing of farmyard manure and filling of pits should be completed by December. Planting distance varies according to variety and system of training. By and large, T-bar and pergola are adopted for planting. In T-bar, a spacing or 4m from row to row and 5-6 m from plant to plant is common, whereas in pergola system, a spacing of 6 m from row to row should be maintained. January is ideal time for planting. The planting should be done at the some depth at which the plants were growing in the nursery. The soil should be firmly placed around the roots. The plants are pruned hard to about 30 cm to encourage vigorous growth. Chinese gooseberry is a dioecious plant; therefore, interplanting of male plants is essential for fruit production. Adequate pollination is essential for the development of good sized fruit while poor pollination may limit productivity. For an effective pollination, to have a male clone blooming at the same time as the fruiting variety is grown is essential. In India, only 2 male clones—Tomuri and Allison—are generally interplanted. To have the male plants evenly spread throughout the area, so that every female plant is in direct “sight “of a male, is also essential. Planting male and female plants in a 1:9 ratio is common. More number of male plants are beneficial although they should not occupy more than one ninth of the total area. This can be achieved by cutting the male plants short as their leaders run along the wire, allowing the adjacent female to grow along into the space formed. Kiwi plants are pollinated mainly by insects, honey bees being most important ones. A large population of honey bees is required in its orchard for a rapid and effective pollination. A small group of 3-4 colonies at the end of each block of 0.5- 0.75ha for even dispersal of forager over the orchard is advised. Training of kiwi vine is very important, requiring constant attention. The main aim of training is to establish and maintain a well formed framework of main branches and fruiting arms. Training also facilitates soil management, spraying and harvesting properly. The supporting branches should be erected even before planting the vines or thereafter as early as possible. Three types of supporting structure (fences) are constructed. A single wire fence is commonly adopted though another wire is sometimes provided by some growers and then structure takes the form of knife in system. One 2.5 mm thick tensile wire is strung on the top of pillars which are 1.8- 2.0 m high above the ground. The pillars are made of wood, concrete or iron and are erected at a distance or 6 m from each other in a row. The wire tension at installation should not be over- strained otherwise wire can break at knot due to crop load. A cross arm (1.5 m) on the pole also carries two outrigger wires. This training is known as T-bar or overload trellis/ telephone system. The laterals arising from the main branch are trained on canopy of three wires. A strongly growing shoot is selected as a main trunk to carry the vine up to the wire. The trunk is staked to provide support and tied at frequent intervals, so that it does not twist around and grows straight. When the vine attains a height of 2 m and reaches near the wire, one permanent leader can be allowed to grow out in each direction along with centre wire. To achieve this, the leader can be trained one way along the wire and suitable placed shoot can be trained in opposite direction as the second leader. Alternately, the initial shoot can be cut just below the wire to force the production of two leader growths which can be trained as leaders along the wire. From the permanent leaders, a system of temporary fruiting arms 25- 40 cm apart is developed, at right angle along both sides of each leader. These arms are tied down to the outrigger wires to hold them in position taking care not to break them out at their bases. The leader should not be allowed to twist tightly around the wire or a restriction or sap flow in future years could result and weaken the vine beyond constriction. Using substantial shoots for training as leader hasten full development of fruiting arms and the time of full production. Growth may be relatively slow during first season but with in 3-4 years the fence should be furnished with strong leaders and fruiting arms in each direction. Training or vines over pergola is similar to that or T-bar fence. The vines are grown as straight, single trunk until they reach a height of two meter near the top of the structure. A single, strong, permanent leader is then allowed to grow in each direction along the main wire. To form the canopy of the pergola, a system of fruiting arm is developed from the leaders at right angle to the wire. Fruiting arms can be retained longer on pergolas and may be more permanent than on T-bar. On more permanent fruiting arms, temporary fruiting laterals are allowed to develop. It is usually takes up to seven years for a pergola to become fully furnished with vine growth. Knowledge of growth and fruiting habit of kiwi vine is essential for its pruning. The vine should grow 2-4 m every year which may become over crowded and unmanageable if not controlled by both summer and winter pruning. The fruits develop only on current season’s growth, arising from the buds developed in the previous year. Only basal 3-6 buds of the current season’s growth are productive. The shoots developed on older wood by heading back do not fruit normally in the first season. Good quality fruits develop on the exposed vines. A shoot dies gradually if it is pruned just beyond the fruiting bud. Thus pruning in kiwi should be carried out in such a way that the fruiting areas are available every year requiring the wood to be young. This is achieved by following a 3-4 year lateral replacement system which becomes a pruning cycle. In the beginning, a lateral arising from main rod is cut back in winter the provide enough space for 4-5 fruiting shoots at 4-5 bud intervals between two such shoots. The strong uprights or the shots arising at undesirable points are pruned in spring when they have not grown too long. This is more applicable to Hayward variety, in which the shoots of only medium vigour bear fruits. In others, vigorous shoots can be pulled back to horizontal position to convert them into fruiting wood. Thus the summer pruning constitutes in shortening back of fruiting arms, thinning out of crisscross and shading shoots. The secret of successful summer pruning is in the selection and encouragement of correct laterals to bear fruits in the next year and expose and vine to the sun. In dormant pruning, the fruiting lateral is cut back to two vegetative buds beyond the last fruit. In the second year, these vegetative buds produce the fruiting shoots which are pruned again. The arms on the lateral shoot and allowed to fruit during third or fourth year. After this, the laterals are removed from the main branch and other laterals are selected and pruned accordingly so that the balance between vegetative and reproductive growth is maintained for the continuity in fruit production. The fruiting laterals which have lost vigour or become over crowded are remove to encourage the development of new laterals. Since the fruiting arm is removed after the third year it implies that about one third of the total fruiting arms are cut away from the vine each year. These are cut back to permanent leaders. Dormant pruning must be completed by mid February each year. The quantity of fertilizer varies with soil fertility, age of vine and fruit production. The nutrient removal by kiwi plants is much higher because of more yield, and removal of summer and winter pruning. Thus N, P and K should be applied on yearly basis, while the other elements on requirement basis. Generally, a basal dose of 20 kg farmyard manure, 0.5 kg NPK mixture containing 15% N is applied each year. After five years of age, 850-900N, 500-600g P, 800-900 g K and farmyard manure should be applied every year. Kiwi requires high CI because its deficiency adversely affects the growth of shoot and roots. In contrast, excess levels of B and Na are harmful. The N fertilizer should be applied in two equal doses, half to two thirds in January-February and the rest after fruit set in April- May. In young vines the fertilizer is mixed in the soil within the periphery of the vine, and for the matured vine it is broadcast evenly over the entire soil surface. Under moisture deficient conditions, the fertilizer application may be harmful to the plant. Permanent soil culture predominantly with clover and clean basin is the best system of soil management. In view of the danger of soil erosion in hilly areas, sod culture is more justified. The natural weed cover provides good sod and helps conserve soil and organic matter. The clover sod is most common in New Zealand. It can be maintained in our conditions also. The sod or the natural weed cover should be regularly mowed and can be used as mulch (10cm thick) during summers. Weedicides can also be used. However, kiwi fruit is susceptible to several residual herbicides- Bromocil, Terbacil, Chlorthiamid and Dichlobenit. Green manuring and intercropping with vegetables and leguminous crops can be practiced during initial 5 years of plantation. Kiwi plants require much water due to their vigorous vegetative growth, leaf size, vine habit and high humidity in their natural habitat. Therefore, it cannot be successfully grown in rain fed areas. Moisture stress during summer adversely affects fruit size and crop returns, therefore summer irrigation is essential to cope up with growing period of fruit. Irrigation is also needed during September and October when the fruit is in initial stage f growing and development. Irrigation at 10-15 days interval is quite satisfactory for good economic returns. It takes 4-5 years fro a kiwi vine to start bearing worthwhile fruits and 7-8 years for commercial production. The harvesting period varies from area to area. The fruits mature earlier at the lower altitude and later at higher altitudes because of variation in temperature. 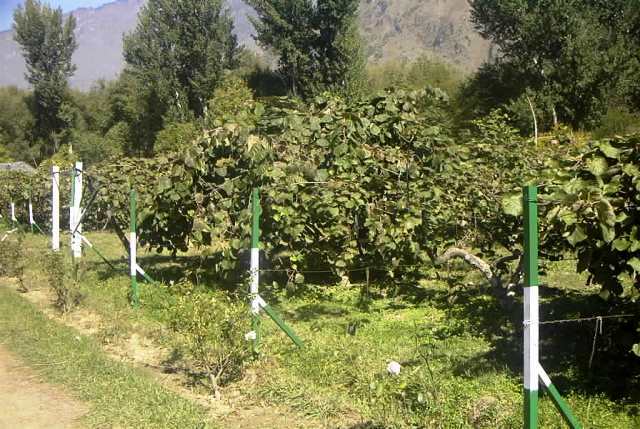 Under Solan conditions, the fruits can be harvested from October end to third week of November depending upon cultivars, whereas under Shimla condition, the fruits are harvested from last week of November to December. Kiwi fruits having 6.2% TSS are ideal for harvesting. But delay in harvesting deteriorates their storability. They are easily harvested by snapping off the fruit at the abscission layer at the base of the stalk. At least two pickings are made. Larger sized berries should be harvested first while smaller ones should be allowed to increase in size and improve in quality. After harvesting, the fruits are rubbed with a coarse cloth to remove stiff hairs found on their surface. Hard fruits are transported to the market. Subsequently, they lose their firmness in two weeks at room temperature and become edible. On an average, kiwi yield varies from 50 to 100 kg fruits/ vine. Vines on trellis produce about 25 tons/ ha after seven years. 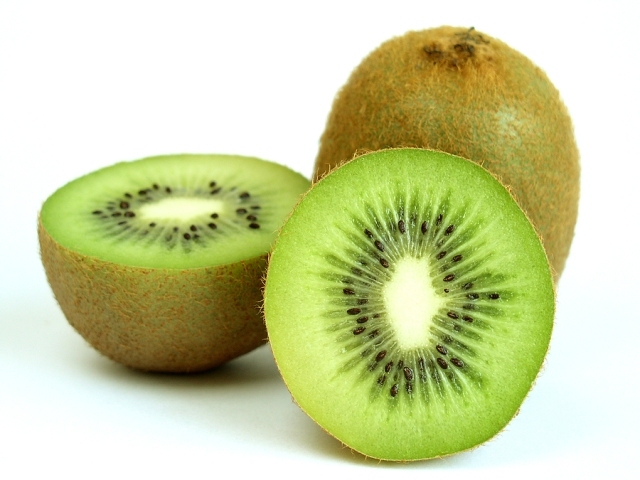 Kiwi fruits have an excellent keeping quality. The fruits can be kept in a good condition in a cool place without refrigeration up to eight weeks. It can be kept for 4-6 months in a cool storage at -0.6` to 0`C. In India, there are no grading standards for kiwi. However, grading should be done on the basis of weight. In international market, fruit weight of 72 kg is the minimum for export while 100 g is the preferred weight. In India the fruits weighting 70 g and above are graded as ‘A’ grade fruits and between 40 and 70 g are graded ‘B’ grade fruits. Since there is no standard package for kiwi fruits, card board boxes of 3-4 kg capacity are generally used for packing. Polythene liners in storage cases are very effective in maintaining high humidity and can be used to maintain fruits in good condition for a longer period.